Comes in a simple cardboard box with spare O-rings and a user manual. Pocket clip was already in place, the clip can be reversed too. The smooth reflector is as large as possible, and looks like it will throw pretty well for this flashlight size. The LED is a cool white XP-G2. All seems to be nicely machined and assembled. Proper tailcap assembly, with a switch on PCB. Aluminium 16mm diameter LED board. Still in the head (forgot to take it out for the picture) is a green glow in the dark O-ring. It’s not really small for a straight tube style design. This is due to the tailswitch and the relatively large reflector. But it’s also rugged because of the slightly wider overall diameter. Seems legit, and yes, it’s pretty bright. Similar output claims as above mentioned competitors. Four modes, always starts in high mode: HIGH – MEDIUM – LOW – MOON. To my surprise it uses PWM on all modes with a 14500 (Li-Ion). The picture above shows moon mode on a 14500. Lumen output is quite similar in high mode on 14500. But, due to the larger smooth reflector the hotspot of this ThorFire TG06S is tighter and thus brighter. The ThorFire T06S is a well built rugged AA / 14500 light with a good amount of throw for its size and form factor. The driver, although it provides the light with a high output, could have been better, like the Jetbeam driver for example. Improvements are in the driver: increased output plus a moon mode. I thought that I read somewhere that they increased the pwm frequency, but apparently that was another light. Thanks for the review Jerommel. They will let me do a review in the TG06S too (light has not arrived yet), I’m going to think about what I can add to your review, perhaps a runtime graph if someone else does not beat me to that (it seems we will get some more reviews on the TG06 soon). Good straightforward review, J. I’m not sensitive to pwm, so I’ll be lookin for a sale on this light. Nice review thanks!! If you have a multimeter you can use the AC-Hz setting to get a good measurement of the PWM frequency. It reads the DC PWM pulses like an AC square wave and will display the frequency. Sorry thorfire, that low frequency PWM is a deal breaker for me. If you have a good multimeter and a spare LED (6-12 volt one like an XHP70 or XHP35 recommended) you can measure the PWM optically too. Just shine the light on the emitter. This doesn’t work on all cheap handheld DMMs though, especially the low moonlight modes cause problems. I just got the Thorfire TK4A for review. It has PWM too but at 20.9 kHz, it’s not visible to the naked eye. Yes Maukka, i was thinkig to hook up a small solar cell on my computer audio input and have a look at the wave, but i didn’t get to it. Kramer, i have 2 DMMs, but neither of them have a frequency counter..
By that you mean ALL modes show PWM with a 14500?… including the highest/brightest one? The PWM is what kept me away from this light. I really wanted an AA/14500 clicky light for EDC so that I can have the brightness of Lithium but the ability to use standard AA cells in a pinch. Unfortunately I work around a lot of moving equipment so low frequency PWM is a big no for me. Yes, PWM in ALL modes with a 14500. With NiMH, only PWM in Med & Low. Nice find. This light is a steal for sure at that price IMO. Yes, thank you for posting this. I made an order on AE. TG06 is a solid AA/14500 flashlight, so the “S” version is a must-try. It’s a shame about the PWM. OK big time deal breaker for me then. Its not like this is the only AA 14500 light out there. There are many that do not use visible PWM. Not sure if anyone cares but it’s on sale at Amazon for $11 and some changes (35% off normal price $16.99). I just got one. Pardon my question, how do I use the AC-Hz setting of the DMM to measure PWM frequency of the flashlight? Is it the same procedure as measuring the tailcap current (set to DC ampere setting), but instead set to the AC current/Hz setting? I tried doing it (ie. 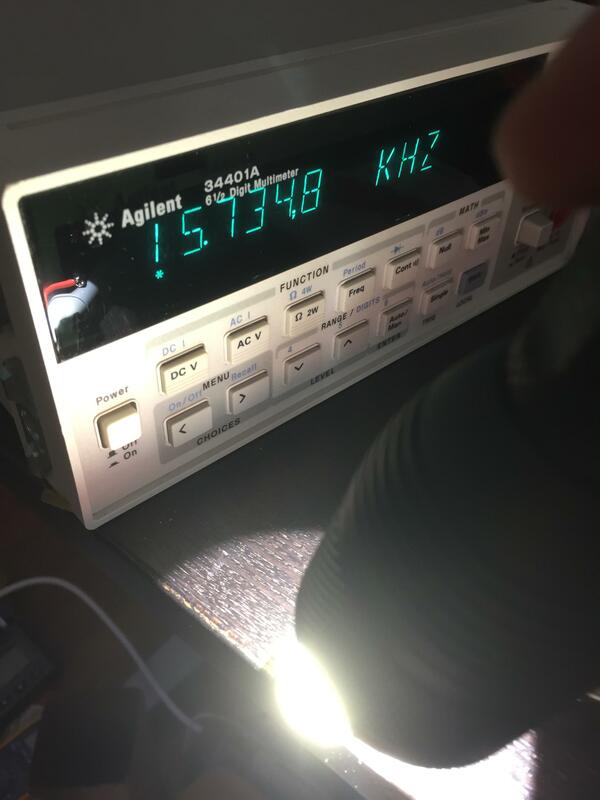 like I was measuring the tailcap current, except with DMM set to “AC current/Hz” setting), but it displays 0.00 Hz only — maybe I’m doing something wrong here? Picked this up last month and taking it camping over the next week or so. Love this review. Plus it looks very easy to mod and at this price point is a fine host. Might have to find one to swap for a 219c or xpl hi 90cri along with a better driver. I don’t find the pwm noticible durong biking or dog walking but I don’t care for the mode layout. Would prefer l-h or m-l-h layout. Especially with the reverse clicks.